The new iMac all-in-one desktops released this week include Intel's yet-to-be-released Z68 chipset, which could allow faster solid-state drive caching performance in the future. As picked up on by tonymacx86, the Intel Z68 chipset for Sandy Bridge 1155 is not set to debut for another week, on May 11. Yet Apple's new Thunderbolt-equipped iMacs, released on Tuesday, were granted first access to the new chipset. The Z68 chipset allows for solid-state drive data caching when a system is equipped with either a hybrid SSD/traditional drive or a combination of a SSD and a traditional drive in the same machine. Apple's new iMacs, in both the 21.5-inch and 27-inch screen sizes, come with a build-to-order option for a 256GB solid state drive. User "diver" on the tonymacx86 forums speculated that since Apple's SSD option is 256GB and an extra $500, it's unlikely that Apple is using the caching feature, which is intended to boost performance with hybrid drives or smaller, cheaper solid state drives. Apple's upgrade comes with Mac OS X and all applications installed entirely on the solid state drive by default, while the extra 7200rpm spinning disk drive can be used for storing media and files. But the inclusion of the Z68 could signal the adoption of hybrid drives or solid-state boot drive combos in future Macs. 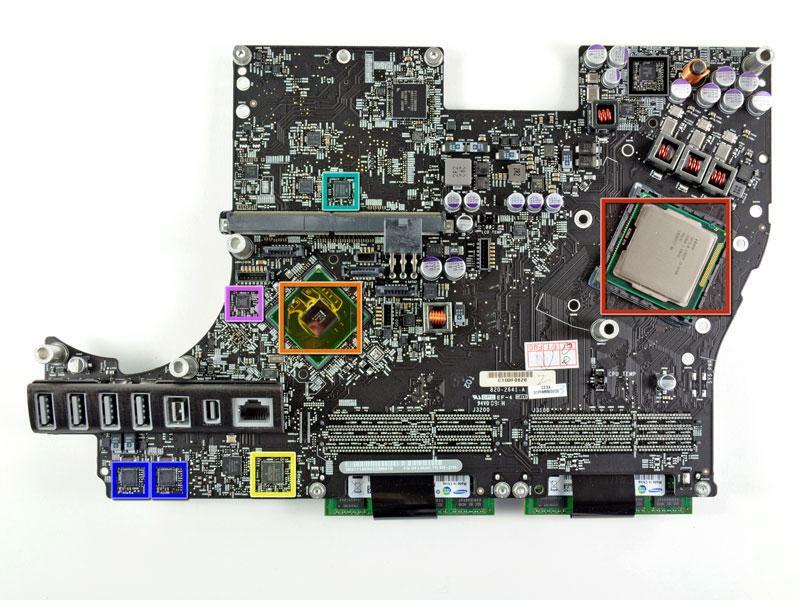 Apple's adoption of the Z68 chipset was noticed after iFixit conducted its teardown of the new 21.5-inch quad-core iMac. That look inside the machine revealed the Intel BD82Z68 Platform Controller Hub. It is not new for Apple to be the first to sport Intel's latest hardware in its devices. Apple has previously enjoyed short-term exclusivity of Intel chips in its Macs in years past. And the new high-speed Thunderbolt port, developed by both Intel and Apple, first appeared on the new MacBook Pros introduced earlier this year. Intel said in February that Apple will have a year-long head start in deploying the technology, which allows data transfer rates of 10Gbps.